I am not a person that wells too much in emotion for very long. I like to think that since, at the core, I have always been a “glass half-full” gal, I have that inner rubber band that snaps back in the other direction when I get too down in the dumps. Lately, for the first time in my life, I have successfully managed to use exercise as a way to 1) stay away from food, and 2) to work out the frustrations of the day. Now, before I get ahead of myself… this has only been for three weeks, but the timing could not have been more perfect. 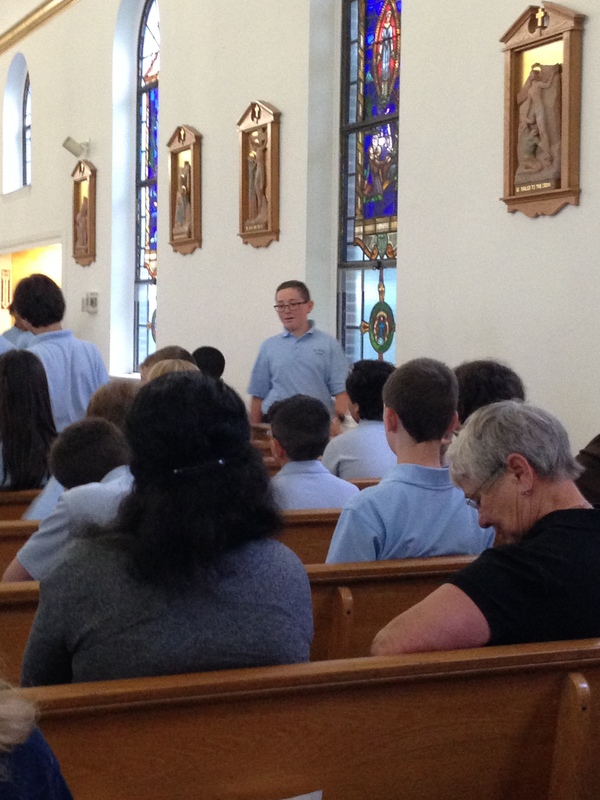 My son finished 6th grade yesterday, and has now crossed into junior high status. 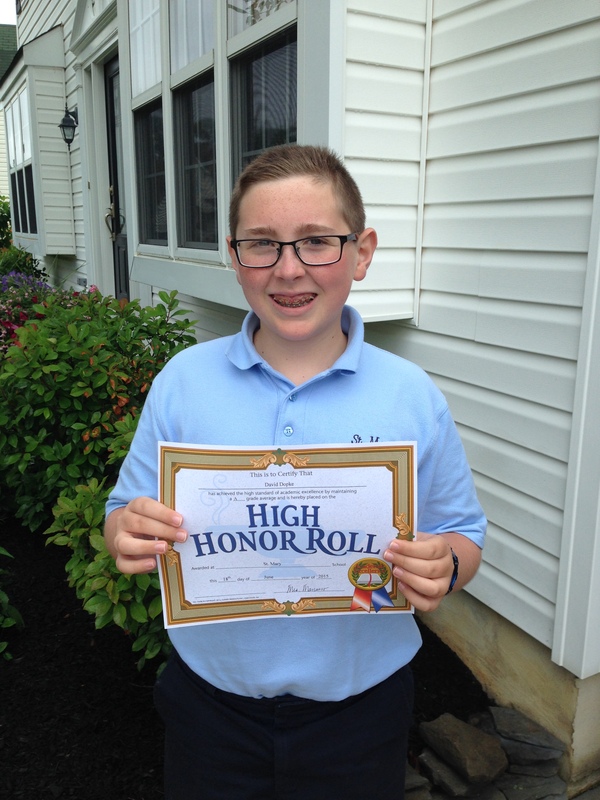 He also had a great year, academically speaking, which is a monstrous achievement for him. Just as he and I were flying high at the prospect of 7th grade looming, we were quickly grounded upon hearing he has classwork in addition to his required reading for the summer. A full-blown paper to write, and, to welcome him back in the Fall… a TEST immediately on his return in Math. For the love. sigh. We have not even met his teachers yet and they are already bringing us down on Day 1 of summer vacation. 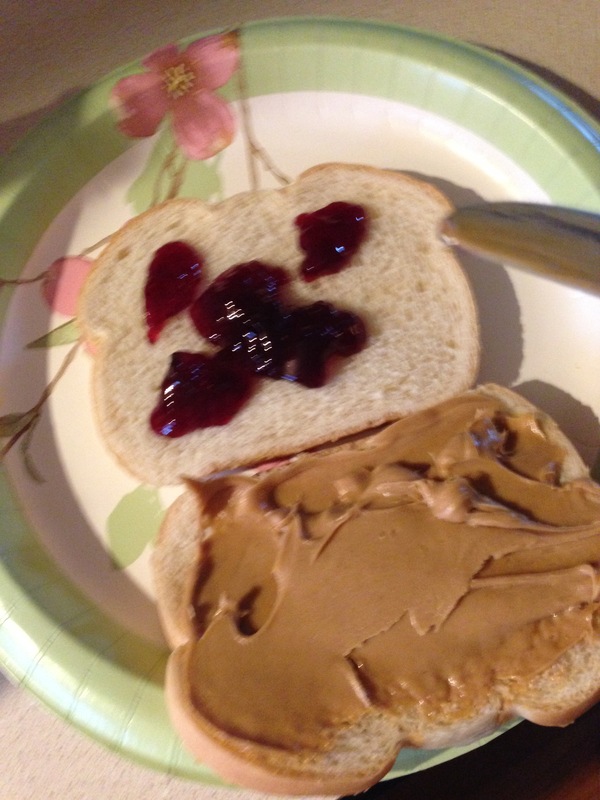 By the way, that photo of the PB&J sandwich? Mine, which I made the day before. I didn’t mean to put a buzzkill on the mood of the day, but somehow I managed to create a sad face on white bread. Which I guess is par for the course. it will have to do. As we pulled out of the parking lot, I got a little misty-eyed. Time is moving way too fast. In fact, I pretty much missed a big chunk of it this year. Not physically, but mentally. My boy is becoming a successful young man, despite my lapses in parenting at times. In fact, he’s almost a mini-me. Soon the pews will run out, and then…..? Next year, I’m standing on the wall. …and bringing my SLR camera. Why is it so hard to make decisions as we get older? Is it because we are fearful of repeating mistakes from our youth or have we grown so wise to know that even small decisions can propel us onto a vastly different path? I used to say I have grown to be a better decision maker because of age and wisdom. It has given me the luxury to better weigh the pros and cons of any situation. That old tried and true method of making a list? It still has its merits. But lately, I’ve grown wistful of being that carefree young girl that acts first and hopes for the best. Where is that girl that jumps in head first? Why am I so afraid to walk to the edge and look down? Truth be told, I have a right to be scared. My track record lately… Dubious. I have no right to expect… anything close to perfection. In fact, I’ve gotten a heavy dose of imperfection in recent years. I’ve learned to live with that. Yet I still made decisions with a belief that they were for the best. Even when I learned, in hindsight, they were not. Bad decisions? They sting a little more because we realize they were bad after much reflection. Which sort of makes it all the worse, because it feels a ton heavier when you micro-manage the hell out of a situation and still realize the buck ultimately stops with you. Forever. It is a bitter pill to swallow. Each time we allow the doubt to creep in, a little confidence is chipped away. And if there isn’t enough good stuff in the meantime to fill the gaps? Well, decisions move from a simple yes/no to an albatross on your back. I am stuck under an albatross. And because of my inability to make a decision, multiple decisions really- I am struggling under a weight just too big to budge. Last I left off, I was having a moment of clarity and obsession in the middle of the night with a bottle of Gatorade. Since then, I have managed to completely change my life and the direction of my health. This is a big thing for me. As much success I have had in other areas of my life, I had as many failures in caring for myself. I wish I could say that it was totally a result of work/life imbalance, because honestly, I had myself believing that too. I know now that the struggles with infertility wasn’t the real issue either. It was tragic, yes, but not the crutch that hindered me from being a better version of me. It was simply, me, being unkind to myself. Putting myself last because I never, ever knew any differently. Since forever. It is probably a blessing I don’t have a daughter. Somehow, I am sure that I certainly would have carried on my own insufficiencies into another human. I have a plastic Easter egg in my desk at home, once shoved into the back corner of my junk drawer. In the egg, I wrote words on a slip of paper. It was an assignment I received at a weight watchers meeting in 2005. For the umpteenth time, I was trying to preserve any part of me that I could. Control SOMETHING, anything…. I was in survival mode, really. My WW leader asked us to each write a promise to ourselves and put it in the egg. I stuck that purple egg in the drawer. I knew it was there. I knew it was there each time I failed, fell off the weight wagon, again and again. I knew it was there each time I sunk my spoon into a pint of Ben and Jerry’s ice cream because I wanted to deaden any emotion that even came close to admitting failure. I remembered it was there when I cried because I made a mistake, a bad decision, hurt someone, or let myself down. Yet, in four years I just left it unopened. I figured I would eventually toss it out next time I purge the junk drawer. After all it was JUNK…. Right? JUNK because I just couldn’t take seriously the thought of ever loving myself. Then, the ultimate low. The last straw that proved that I was insignificant and not worthy of any goodness. Failing at completing my family, losing confidence in my professional worth, hitting rock bottom. Then, with almost impeccable timing, my body started to revolt. It was pissed off over being mistreated and discarded. I got scared. I spent the last 6 months in a revolving door of doctors. My bones ached. I couldn’t walk. Was I depressed, sick, or going mad? I suddenly felt all of my 44 years crashing down on me. Tentative diagnosis as of now, Fibromyalgia and sleep issues, waiting another referral to rule out more bad stuff. Merely the tip of an iceberg, but a step to knowing. A wake-up call indeed. It was time to get my temple in order. This was my rock bottom. I remembered the egg. It wasn’t going to gather dust any longer. I finally opened it this past January, and renewed my promise to me. Something is different… this time. I can’t put my finger on it. I still have days I feel like I am 90 years old, but I also have days I feel I can conquer the world. I changed the way I view food. Which is insanity in my mind anyway… I have this bad habit of never breaking bad habits. But here I am, three months later, and finally giving myself the time to heal and be renewed. I am not going to let anything chip away at the progress I made. It shows on the outside.. I am a pound shy of 30 pounds lighter. In physical weight. Probably even lighter on an emotional level. There is no reason I should feel so good while feeling so bad. Strangely, my newfound love is catching root in the oddest of places. My husband, my son. They don’t see the positive change around us, but I do. I still have a long road ahead. But for the first time ever, I am walking in my own shoes, feeling my heart, accepting the unclarity of life, and not afraid to fail. Well, that’s the diagnosis anyway. I had another visit to the dermatologist and received another bucket of injections to the head. My hair is still falling out, although it is slowing down just a bit. Perhaps that is because 60% of my hair is gone. Less to fall out, you know. I am seeing some regrowth, thanks to the cortisone injections. Just very fine hairs, and very small, but some. When I pull what hair I have back into a hair clip my head looks like a bad stylist went psycho with scissors. Thankfully, most of the bald spots are on the sides and underside of the hair that I have, so when the hair on top of my head falls left or right, I look not as terrible. Something happened at my appointment that terrified me. He went on with an explanation, but all I heard from that point on was ringing in my ears and a feeling that my stomach had sunk to my feet. I had some basic autoimmune and clotting testing done after my second miscarriage, but I had always wondered if I dug far enough. I only had the basic panel. I was thisclose to referring my case on my own to a well-known doctor who works with this scenario after miscarriage #5. And I always, always thought something was quirky with my immune system. Bad reactions to certain fertility drugs. Curious reactions to anti-inflammatory drugs. Pregnancies that progressed just so far and miscarriages that always ended with a normal tissue analysis. No chromosonal abnormalities. Normal. Normal. Normal. But I had a baby once before! Doctors surmising… just bad luck, BAD LUCK. Ok, changed our mind…. bad EGGS. After all, you are over 40 now! I asked my RE back then about immune issues, but was told it was improbable with one normal, live birth. I was sent on my way from the dermatologist with a prescription for topical hair medicine and a diagnosis. I think I just opened a new door I can’t shut. It may just as well break me for good.